With 2017 starting to tick away and uncertain political changes brewing in our nation’s capital (which put at risk America’s clean air, clean water and clean food), we would like to renew our commitment to knowing where our food comes from and to express gratitude to the farmers and growers who produce food with concern for the environment and humanity’s healthy future. With that in mind, we urge our readers to make a commitment to build their local communities by buying local food that is produced by farmers and growers they know and trust. And we encourage membership and participation in Community Supported Farms (CSAs) and hope that our directories of CSAs will provide helpful guidance on locating a farm to join close to home. We would also like to share the list of 10 Reasons to Buy Local Food articulated by the Appalachian Sustainable Agriculture Project (with our very minor tweaking) to hearten our readers with the knowledge that daily life can be greatly improved by choosing to eat local foods. Eat fresher, better tasting, healthier foods. When produce is shipped hundreds or thousands of miles, it loses crispness, flavor, and nutrients on the way. Foods grown to be shipped may be picked before they ripen and treated with more chemicals. Local foods haven’t traveled so far and are fresher. If you’re buying at a farmers market, the produce has often been picked that morning. Enjoy seasonal produce and regional varieties. As the seasons change, so do crops. If you eat locally, you’ll be trying new things throughout the year. You’re also likely to be eating what naturally grows in your area. While industrial, corporate farms grow varieties that ripen quickly and store well, family farmers often cultivate heirloom varieties that are unique to your home and a part of its heritage. Support your farming neighbors. Fewer and fewer farms are able to stay in business. Faced with increasing costs and competition from corporate farms, it’s getting harder for farmers to make a profit. Use your food dollars to support a family you know, not a big business based elsewhere. Sustain rural heritage and lifestyles. Farming has long been a way of life, and family farmers are a central part of our communities. Protect natural beauty and open spaces by preserving farmland. As land prices and property taxes increase, more and more farms are sold for development. helping to make local farms profitable saves the rural landscape. Encourage sustainable farming practices, benefiting human, animal, and environmental health. Family farmers value their water and land because they must maintain these resources to continue farming. Family farms often use less fossil fuel and fewer chemicals than industrial farms. Family farmers are also more accountable. Unlike a company in another country or state, their customers can observe their practices. 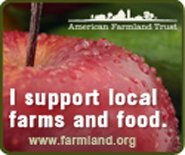 Strengthen local economies and keep your food dollars close to home. The uncertainty of the global economy makes clear the need for local economies. Use our purchasing power to create local jobs and pay taxes that benefit your own community. Sustainably-raised foods sometimes cost more at the cash register, but their long term costs to the environment and society are far less. Maintain and build local food systems so we can feed ourselves in the future. We must make best use of our good farmland, as well as developing the ability to process and distribute food within our region. Keep farming skills alive, and farmland available. We must ensure that farmers’ essential knowledge is passed on, and make staying on the farm a good option for young people. Get to know who grew our food and where, so you reconnect with it, and your community. You can put a face and a farm with local food. You’ll learn about the seasons and weather through their effect on crops. If you shop at a farmers market or subscribe to a CSA, you’ll meet your neighbors and participate in a community event. When you visit restaurants and grocers that use local ingredients, you support business that share your commitments.